Special Price £1,545.00 excl. £1,854.00 incl. Vectorworks Fundamentals is the basic package, offering superior 2D and 3D capabilities in an intuitive, easy-to-use modeling and documentation platform. Sketch, model and document all your design ideas. Vectorworks Fundamentals is the entry level Vectorworks product. Like all Vectorworks products, it's easy to use and has a more intuitive interface than many traditional CAD applications. Vectorworks Fundamentals includes all core modelling functionality from the Vectorworks series of products, but does not include any sector-based tools. If you're looking for time-saving, industry specific tools you may wish to consider Vectorworks Architect, Vectorworks Spotlight or Vectorworks Landmark. 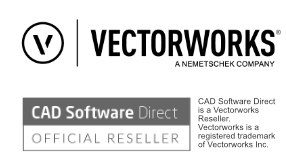 If you want all the features available in one package, take a look at Vectorworks Designer. Vectorworks Fundamentals 2019 is ideal for users wishing to create both technical 2D, and visually accurate 3D drawings. For greater productivity gains, we recommend one of the designer series (Architect, Spotlight or Landmark) products which include additional tools, object libraries and the rather useful 'Navigation' palette and PDF export. Vectorworks' extensive suite of drawing and editing tools make quick work of any type of project, helping you to produce beautiful drawings and high-quality, professional documental with ease. Add gradients, tile and image fills, stipples, and hatching. Easily incorporate digital images and graphics, and produce accurate technical documentation and compelling presentations. Vectorworks Fundamentals provides an advanced suite of Parasolid-based solids and NURBS surface tools that let you create any shape and easily explore geometry. Push, pull, blend, twist, sculpt, deform, or punch holes. With it's intuitive interface, you can design from any 3D view using modes in modeling tools that automatically infer working planes as you move your cursor, and enjoy the superior quality that allows you to manipulate your model with ease. More accurate object information and better snapping make drawing in 3D easy. Work on practically any type of project within a flexible and robust digital environment. Start with any image, sketch, or formal iteration and move easily between 2D and 3D views in a unified working environment. Vectorworks provides a flexible way to manage productive workflows for even the most complicated project. Make your work even more compelling and easier to communicate with digital imagery. Import scans, digital photos, or web images. Import or export a wide array of image files. Exchange 2D drawings and 3D models and data for numerous multidisciplinary, multi-platform design workflows, as well as sending models to CAD/CAM machines, CNC routers, and other 3D printers.